There’s no better what to explore Japan than going local. You’ll get to experience Japan in an authentic way not found elsewhere. With JR Passes , Travelers Had A Wonderful Journey with Huber Tomodachi Guides. Adam and Maggy visited Japan from Germany. This trip to Japan was a birthday gift to Maggy since Adam loved Japanese culture and wanted her to travel there! They visited multiple cities in Japan using the JR Pass. Their route looked like this: Tokyo – Kyoto – Hiroshima – Beppu – Mt.Fuji – Tokyo. What was most important for their trip was “meeting people and have a memorable time while exploring towns!” What made him travel with Huber Tomodachi Guides was the past experience that he had during a trip to Korea, where he met local people and traveled around towns. From now on, I would like to share little pieces of their wonderful memories in Japan! You may find a new way of fulfilling your trip with local guides! Their trip began in Tokyo. Speaking of Tokyo, Shibuya, Shinjuku, Tokyo Tower, Imperial Palace, Asakusa, Ueno, and Akihabara are the most popular spots among most first-time visitors. Many wish to efficiently see as much as they can on their trips. However, Adam and Maggy did not share this belief and wanted to visit spots you cannot find in guidebooks. What he actually did was to meet Huber Tomodachi Guides to see and experience their local lifestyles as if he and Maggy lived in Shibuya. The local guides named Hanako and Ken started the tour at Adam and Maggy’s hotel and headed to Shibuya. First, they visited must-visit spots such as Hachiko Statue, a dog with such loyalty, he waited for his owner until he passed away, and Scramble Crossing, where once, 3,000 people crossed during a single signal change. After that, their Shibuya adventure began! They visited a hidden shrine in a nightlife entertainment district, took “purikura” (kawaii photo booth), and played a Japanese drum music game. Then they went to a locals’ favorite store to buy lots of Japanese snacks at reasonable prices and had crepes with whipped cream and fruits. While Adam and Ken went to eat ramen, Maggy who is a vegetarian, went with Hanako to eat something else. At the end of the day, they all reunited at a tiny little bar in Nonbe Yokocho Bar Street in Shibuya for as long as they could. This is just one way local people spend their weekend in Shibuya, but Adam and Maggy enjoyed the night there with Huber Tomodachi Guides. Japanese Culture?! 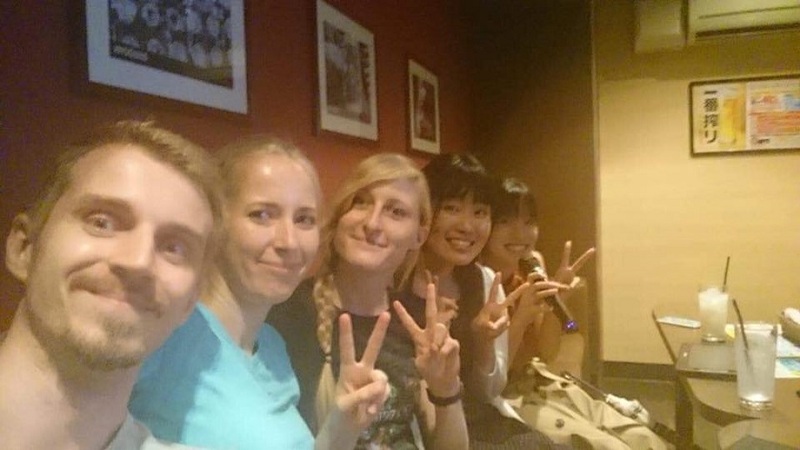 Karaoke in Kyoto! Locals, Miyu and Yu, waited in Kyoto for Adam and his sister. Maggie’s friend from her online game also joined them on the trip! Instead of heading to one of the many temples or shrines that is said to be more abundant than convenience stores in Kyoto, the 5 of them went to a matcha fondue shop! In addition to Tomodachi Guide’s Miyu’s plan, Adam wanted to try karaoke, so they added it to the plan. While at karaoke, the smile on Adam’s face, showed his satisfaction and achievement of finally trying karaoke. Whenever Adam was curious about a Japanese thing, he asked the nearby Tomodachi Guide. At the Kyoto cafe where they ate matcha fondue, Adam was surprised by the milk and exclaimed, “What’s this? !” It’s considered normal in Japan, but as shown in pictures, sugar and a small cup of milk are prepared separately. You can add the amount of milk and sugar that is to your liking. In Germany, Adam’s home country, it is normal for the milk to be already added in the drinks. Adam was very quick to point out the cultural differences between Japan and Germany. I would love to list all the questions that he asked, but I won’t list them this time. Let’s come to Japan and have fun while finding the many cultural differences between Japan and your country. Originally, Adam did not plan on going to Beppu, he initially planned to go to Okinawa. However, due to a typhoon, he was unable to go to Okinawa. A Tomodachi Guide in Tokyo, Hanako, recommended to Adam, that if he likes hot springs, he should definitely visit Beppu. Hot springs masters, Timo and Junya, waved as Adam and his sister exited Beppu station. Once everyone gathered, the tour where you can enjoy the hot springs using all five senses began! While dipping their feet in the foot hot spring, everyone ate eggs that were boiled using the steam from the hot spring. While at this foot hot spring, located in the mountains, everyone listened to the calming sounds made by the trees and water, surrounded by greenery, and the pungent smell from the hot springs filling their noses. In the hot springs, local people casually and naturally joined in the conversations. After taking their time and enjoying the foot hot spring, they talked to locals and went to go look at one of the area’s unique hot springs. The hot spring that they went to look at, is a mysterious turquoise blue, whose water naturally comes from the earth. They also viewed the steam rising from the ground, something that is famous in Beppu. After smelling, feeling, eating, listening, and seeing, everyone was able to fully experience the hot springs using all five senses. It was truly a hot springs trip. 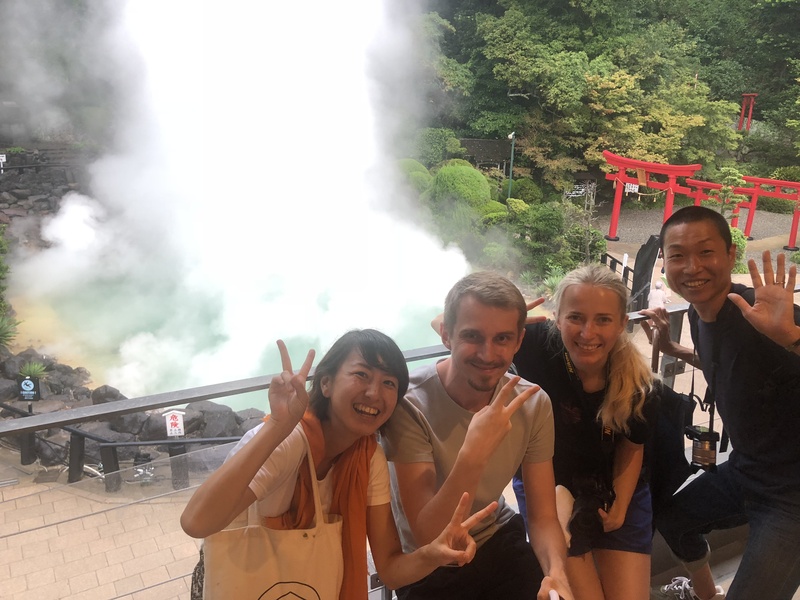 During their time immersed in the hot springs, Junya and Adam spent the hour learning about each other, Beppu, and even studied some Japanese, enjoying their intercultural exchange. Finally, they met some locals in the area, ate dinner, and parted ways. While parting, everyone hugged each other goodbye! When traveling with Tomodachi Guide, there are of course fun times, but there are also new encounters and with them, farewells. While parting ways, everyone says, “See you again! (Mata ne in Japanese)”. Now to the next journey! In Osaka, Adam and Maggy met with Kyoto’s Tomodachi Guide Miyu again. Together, they went to the arcade and then ate. Afterward, it was time to head back to Tokyo. Adam and Maggy visited Mt. Fuji with local guides, Kouki and Mana, from Tokyo. Tomodachi Guides let you travel as if you are with your friends. They enjoyed every single moment of the trip. During the trip, two miracles happened! The first one happened when they finished lunch and left the restaurant. A traditional festival was approaching with the beat of Japanese drums! While they walked along the line of local people, the locals shared snacks and beverages with them. If their timing were even a little bit off, they wouldn’t have been able to experience this festival. The second miracle happened when they were seeing Mt. Fuji. The mountain is often covered by clouds, so it is uncommon to see the whole mountain clearly. This was a rare opportunity where they could clearly see the entire mountain. They were fortunate to see this great view. Mt. Fuji is often covered by clouds and is a common sight for locals and travelers. This just shows how lucky they were to see this. With this sight, their excitement grew. All travelers in Japan have different expectations for their journeys. Traveling has different meanings for everyone. Travelers interpret things differently even when they see or do the same thing. Visiting places mentioned on this page, traveling to meet with local guides who will join your journey, and meeting new aspects of Japanese cultures are all great ways to spice up your journey. Japanese people tend to be shy, but we all welcome you to Japan! Tomodachi Guides wish for you to have an amazing journey while in Japan! When you plan a journey to Japan, we want you to discover something new while you spend your valuable time here. Japanese people may be shy but are born with a philosophy of Japanese hospitality called “Omotenashi.” We wish for you to have a wonderful time with Huber Tomodachi Guides.